General Hospital (GH) spoilers for Thursday, December 6, tease that Liesl Obrecht’s (Kathleen Gati) Cuban adventure will come to a screeching halt. She’ll be all smiles as she walks into a dance hall, but she won’t expect Finn (Michael Easton) and Anna (Finola Hughes) to be standing there. They’ll let Liesl know that the jig is up, so we’ll see how Dr. O handles her latest round of chaos. In the interrogation room, Griffin (Matt Cohen) will remain on edge. Chase (Josh Swickard) did a little more investigating and found out the killer used a very precise method of stabbing. Thanks to Ryan’s (Jon Lindstrom) expertise, most of Kiki’s (Hayley Erin) blood remained in her body. Chase will confront Griffin in Thursday’s GH episode. He has to cover all his bases, so he may accuse Griffin of having the knowledge to pull this off. General Hospital spoilers state that Griffin will battle some frustration here. He won’t know how many times he has to say he didn’t do it. Over with Alexis (Nancy Lee Grahn), she’ll have an intriguing meeting that could help her client. Sam (Kelly Monaco) will insist that she has evidence to get Griffin off the hook. She’ll explain the situation to Alexis, so the determined attorney will have hope. Within the next few episodes, Griffin’s innocence will indeed be proven. Meanwhile, Curtis (Donnell Turner) and Jordan (Briana Nicole Henry) will enjoy an escape from the PCPD drama. They’ll still talk about the case, but at least they can do it in the comfort of their own bed. These two haven’t had any alone time since they became husband and wife. Jordan and Curtis will certainly take advantage of their chance at privacy, so expect some steaminess. Curtis will also note that when things seem too good to be real, they typically are. He could be referring to the solid evidence in the case, which is definitely too good to be true. Even if Griffin had killed Kiki, he would’ve been smart enough to hide the murder weapon somewhere besides his closet. This is a clear setup, just like the cops found in the aftermath of Mary Pat’s (Patricia Bethune) murder. Jordan has a hunch the two killings are connected and that hunch will be proven right soon enough. Of course, Ryan won’t be on Jordan’s radar. He’ll be free to commit additional murders if other people get in his way or land on Ava’s (Maura West) bad side. Ryan would do just about anything for Ava as long as it’s ruthless! 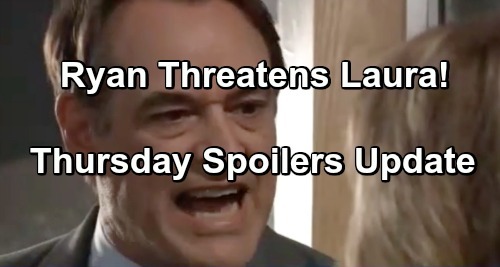 For now, General Hospital spoilers state that Ryan’s anger will erupt. He’ll go off on Laura (Genie Francis), who will probably take jabs at his romance with Ava. Laura will really hit a nerve, so she’ll get a nasty threat in return. Ryan will bark that if Laura ever says anything like that again, those words will be her last! Finally, Michael (Chad Duell) will be stopped as he heads for the GH exit. He just popped in for the bereavement meeting, which Willow (Katelyn MacMullen) also attended. On Thursday, Willow will ask for some assistance. She’ll have forms to fill out, so that might by what Michael comes to her rescue on. General Hospital spoilers say the turmoil will continue in Port Charles, so don’t miss all the action. We’ll give you updates as other GH news comes in. Stick with the ABC soap and don’t forget to check CDL often for the latest General Hospital spoilers, updates and news. General Hospital Spoilers: Charlotte Discovered To Be Nina’s Daughter – Birth Certificate Points To Cassadine Frozen Plot Twist?